We no longer carry the 1996-04 Mustang 4.6L 2V To 5.4L 2V Intake Manifold Adaptors. These intake manifold adaptors allow you to run an intake from a 4.6L on your 5.4L for more power! Making a 5.4 swap but need a manifold? We have what you need to adapt any 4.6 2V intake manifold to your 5.4 so you can make more power and use and use all that extra displacement. 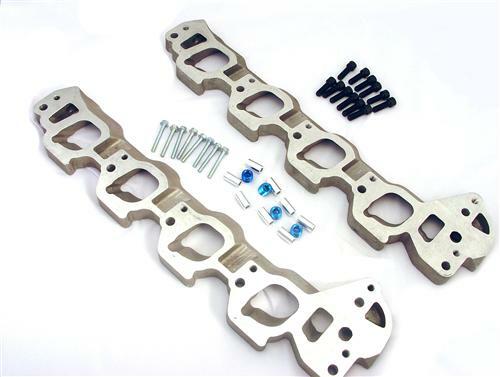 These Professional Products Mustang intake adapter plates are designed to allow for the use of a 4.6L 2V intake manifold on a 5.4L, 2V V8 engine. Many Mustang owners are swapping the larger displacement 5.4L engine into their Mustangs for more power, but there is no performance intake manifold available for the larger 5.4L engine. These Professional Products adapter plates, gaskets, and hardware now allow for the use of any aftermarket 4.6L 2V manifold on this engine.